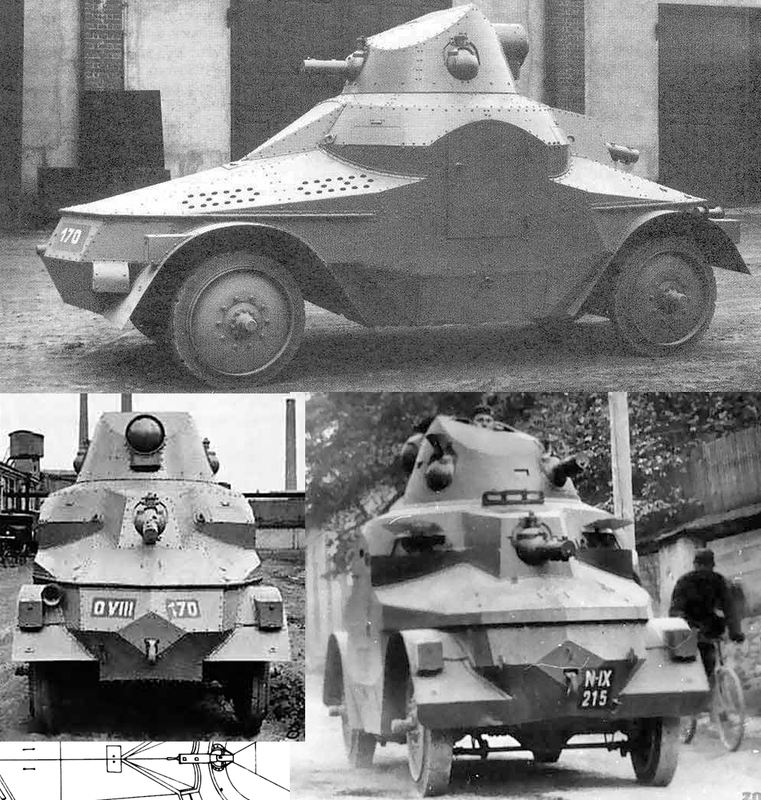 The third armored car built by Škoda, the Obrněný automobil vzor 27, was an answer to the limitations of the previous PA-II “Turtle”, which kept the same revolutionary chassis and symmetrical drive of the PA-I, but dropped the turret and had a new streamlined bodywork integrating machine guns in each corner. The beautifully curved armor was effective, but quite expensive as it appeared and the machine-gun positions were not optimal at best. 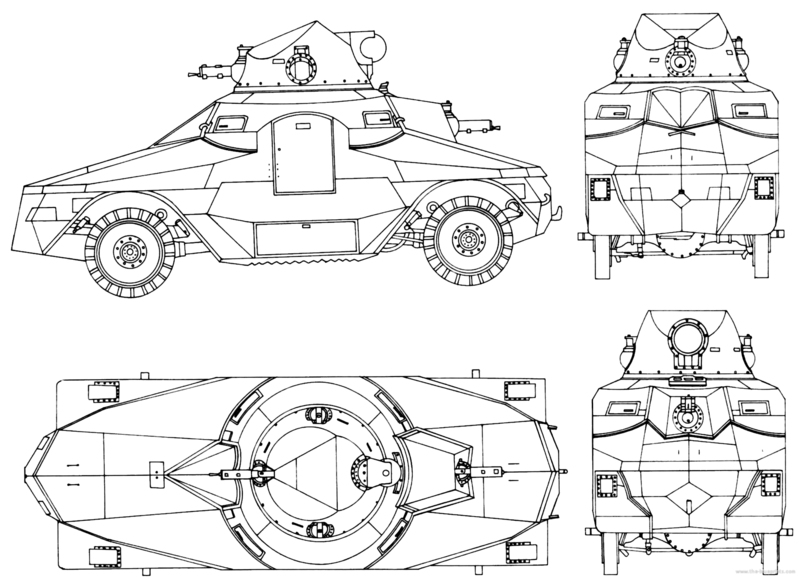 So, in 1925, the engineers tried to reintegrate a turret in the design and create a simpler, yet still effective armored body. The vehicle, in general, needed to be smaller and lighter, thus more mobile. A first prototype with an iron body was tried by the Army in 1925, but the final production was not approved before 1927. 15 vehicles would be built, more than the previous models. The last was delivered in October 1929 under the army designation of P-III. Factory designation was OA vz.27. Like previous models, the chassis called for a very sturdy ladder frame architecture. It was perfectly symmetrical, geared towards a double drive from the beginning. Both axles could be steered by the two drivers, so it was barely a simple “reverse” but a real, full double drive capability. It was not a true four-wheel drive design either. However, the riveted armoured body made of 5.5 mm (0.22 in) armor plates sat of an “angle iron” beams frame, which was not symmetrical. The forward driver sat on the right and had his own observation port protected by an armored shutter integrating a vision slit. He had an assistant driver at his left. At the other end, the opposite driver sat on the left side. A Schwarzlose MG vz. 07/24 liquid-cooled was mounted in the center of the hull, with 72° of traverse. The second one had 360° traverse, as it was located in the turret on top of the superstructure. Access was granted by the central side doors, while the turret itself had a hatch for an observer to stand high up or to dominate the crowd during street riot control. The turret had two other ball mounts on its side, while a single light ZB vz. 26 was carried inside, as well as a total of 5750 rounds. Mobility was provided by a 4-cylinder Škoda gasoline engine, 5.7 litres (350 cu in), water-cooled, 60 horsepower (45 kW). It was “front” mounted (in fact the longer section), giving a top speed of 35 kph (22 mph). This value seems much more realistic than the supposed 70 km/h (44 mph) of the heavier and less powerful PA-II. Otherwise the OA 27 could cross a ditch 40 cm wide, climb a 20 cm high obstacle or ford 30 cm deep river. The PA-III, despite limited production, was used by four armies: The Czech army ued it until the German occupation of Bohemia-Moravia in March 1939. Three vehicles were captured by the independent Slovakia, and three others fled the county in Romania, during the Hungarian invasion of Carpatho-Ukraine. They were seized and integrated in the Romanian Army. Due to their age, they mostly saw service as patrol and training vehicles. In Czech service, they were considered relatively successful due to their reliability and ruggedness, accurate thanks to the optical sights fitted on the machine guns, but still costly (626,770 Czechoslovak koruna) and heavy. They served with the Armored Regiment in Milovice (6) and the cavalry (9). In the 1930s, they were spread into three Armored Regiments. Some saw action against Konrad Henlein’s Sudeten German Party and Sudetendeutsche Freikorps in 1938. Others helped repel Hungarian and Polish border incursions in Slovakia and Ruthenia. Standard OA vz.27 (PA-III). There are no photographic records of any camouflaged vehicles. Montage of various web references and view angles. According to Kliment/Francev’s book, they were painted grey (what was an exception in Czechoslovak Army), to better conceal them on roads.